Every week we pull together some great Canadian recipes from food bloggers around the web featuring one main ingredient or dish. 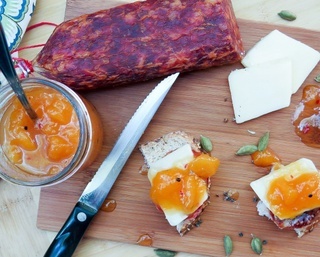 This week we showcase 15 peach recipes - sweet, savoury and sippy! There is nothing like biting into a sweet, sun ripened Ontario or BC peach and having the juices drip down your arm. Infuse your cooking with those same delicious summer flavours all year round with these 15 peach recipes. Peaches work well in virtually every kind of dish - sweet desserts, savoury entrees, eye opening breakfasts and sip-worthy beverages. Use them fresh off the tree or preserve them for the winter so a peach pie or a jar of peach jam is never far from reach. Whatever you do, make the very most of this oh short Canadian peach season! **[Spicy Cardamom Peach Jam](http://theyumyumfactor.blogspot.ca/2015/09/spicy-cardamom-peach-jam.html)** from The **Yum Yum Factor**. **[Yucatecan Fish Tacos with Green Peach Salsa](http://www.diversivore.com/recipe/yucatecan-fish-tacos-with-green-peach-salsa/)** from **Diversivore**. **[Ginger Peach Baked Oatmeal](http://www.shebakeshere.com/2015/09/ginger-peach-baked-oatmeal.html)** from** She Bakes Here**. **[Easy Chipotle Peach Glazed Chicken](http://www.flavourandsavour.com/easy-chipotle-peach-glazed-chicken/)** from **Flavour and Savour**. **[Oatmeal Peach Muffins](https://frenchfriestoflaxseeds.com/2014/09/25/oatmeal-peach-muffins/)** from **French Fries to Flax Seeds**. **[Peach Strawberry Galette](http://www.everydayallergenfree.com/home/galette-recipe-canada-day-locally-farmed)** from **Everyday Allergen Free**. **[Peach Chili Chicken Wings](http://www.theprimaldesire.com/peach-chili-chicken-wings/)** from** The Primal Desire**. **[Baked Peaches with Ice Cream & Salted Caramel](http://isaynomato.com/baked-peaches-with-ice-cream-and-salted-caramel/)** from **I Say Nomato**. **[Peach Red Rooibos Tea Sangria](http://www.naturalgirlmodernworld.com/home/red-rooibos-tea-sangria)** from **Natural Girl, Modern World**. **[Peach and Lemon Balm Salsa](https://myediblejourney.com/2013/08/07/stone-fruits/)** from **My Edible Journey**. **[Grilled Peach and Mint Salad](http://pickydiet.blogspot.ca/2015/08/meatless-monday-grilled-peach-and-mint.html)** from **Picky Diet**. **[Peach Pie Smoothie Bowl](http://chroniclesofpassion.com/2015/07/26/peach-pie-smoothie-bowl/)** from **Chronicles of Passion**. **[Bourbon Peach Pie with Bacon Streusel](http://joandsue.blogspot.ca/2014/08/bourbon-peach-pie-with-bacon-streusel.html)** from **Jo and Sue**. **[Peach Melba Sorbet](http://leelalicious.com/healthy-peach-melba-sorbet/)** from** Leelalicious**. A big thank you to all our FBC Members who participated in this weekend's peach recipe roundup. Oh my… I want to eat all of the things! Yum!